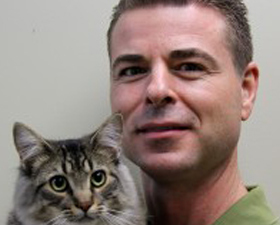 Dr. Donais graduated from the Ontario Veterinary College at the University of Guelph in 1994. Early in his career, he took a leadership role in the operations of his first job in Wallaceburg, a very busy part of a group of hospitals in the Chatham area. During this time, he developed a keen interest in avian and exotic animal medicine and surgery. After a short time in a small animal practice just outside Sudbury, Ontario, Dr. Donais moved to the Newmarket area to open the College Manor Veterinary Hospital with Dr. Bruch in June of 1999. Dr. Donais is a member of the College of Veterinarians of Ontario (CVO), the Ontario Veterinary Medical Association (OVMA) and the Toronto Academy of Veterinary Medicine (TAVM). Dr. Donais is a converted fitness enthusiast and enjoys hitting the gym and has completed several half-marathons. He is an avid fisherman and enjoys boating and “cottaging”. Currently, he shares his home with a tank full of tropical fish and a very spunky cat named “Kingston”. I am very proud of the professional, caring and cohesive team we have at the CMVH. We all work well together to bring the very best level of health care to our patients and their families. A true commitment to continuing education ensures that our entire team continues to strive to be the at what we do. I truly love the variety that veterinary medicine provides. No two days are exactly alike! I really enjoy nature and wildlife photography. Travelling South in the winter is a real favourite!